This fiction series is exciting reading for girls in grades 3 to 6. 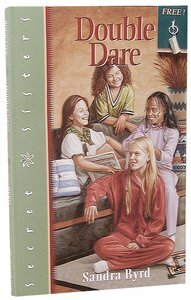 They'll enjoy the adventures of eleven year-old Tess Thomas and her friends as they learn important lessons about life. From Waterbrook. About "Double Dare (#05 in Secret Sisters Series)"
BOOK FIVE DOUBLE DARE Tess wants to be noticed. But making her mark has a high cost. Is it all worth< br> it? Can super achievements change her into someone really special? < br> < br> This year& #8217; s birthday is the worst. First, Tess is cut from the school play. Then all her friends cancel on her birthday sleepover. Worst of all, everyone seems to be great at something& #8211; except her.< br> < br> Tess searches for a way she, too, can be unique and special, like her brother and her friends. Finally, she finds one. She decides to try out for the local gymnastics squad& #8211; and she& #8217; s good But the demands of practice time force her to give up other things she cares about, like time with her Secret Sister, Erin. Making the team might be the answer to her dreams. Or is there something about who she is already that makes her a superstar? Sandra Byrd has published more than three dozen books in the Christian fiction and nonfiction market, including her series for adults, French Twist, which includes the Christy finalist "Let Them Eat Cake".